“Hot today and even hotter tomorrow”. A weather forecast that is becoming all too familiar, even in the middle of winter. All of us are feeling it. Everywhere temperature records are falling, both short and long-term records. Even the weatherman can only guess what longer-term trends look like, However, it seems a safe bet that records will continue falling, but not global temperature. If this were a sporting event, we might celebrate these records, but this is not a game. It is real life. None of us can predict the future, but as the evidence mounts, climate scientists’ most dire warnings are being corroborated. 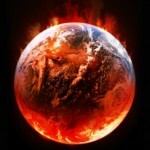 So my educated guess is that next year will again see the hottest global average land surface and ocean temperatures. Hotter means drier and over time, drier means drought. Here in our corner of the world, the Levant, drought is becoming endemic. A recent study showed that the persistent drought from 2006-2012 in the Levant was the worst for the last 900 years. This catastrophe seems to be just the current peak in a long-term drying out of this cradle of one of humanity’s greatest developmental leaps, the Agricultural revolution. A more recent revolution, the Industrial, carried us into the modern age and brought phenomenal gains in agricultural production. All of those gains did nothing for Syria in the midst of the unprecedented drought. Crops and farms failed. Thousands fled the countryside for the cities. Poor, economically struggling masses caused collapse of any national social support systems that may have existed under the Assad family dictatorship. Convergence with the “Arab Spring” uprisings resulted first in protests, then outright rebellion and chaotic, brutal civil war, leaving zero hope of a better life for millions. Connecting the dots, what do we see? Hundreds of thousands of refugees knocking on Europe’s door. The climate induced collapse of the agricultural economy of Syria, and the brutality of its civil war, are now exported to threaten the fabric of European unity. An iconic image of a child’s lifeless body child washed ashore wakes the world wakes to the reality of an historical turning point – how will we cope when millions seek refuge from prolonged droughts, floods and climatic catastrophes exacerbated by failing states racked by internal and external conflicts over resources? Humanity, only recently obtained the god-like power, through the application of science via technology, to dangerously impact on the natural life-supporting systems developed over millennia on Earth. Our modern, “enlightened” era of unending growth witnesses new peaks, decade upon decade, in rapacious exploitation, consumption and waste of precious resources. We have come to see ourselves as separate from the Earth and its intelligent, purposeful array of feedback loops and systems that sustain all life. The created world where we carry out our dance of history is greater than the sum of its parts. In her vastness, the Earth has absorbed reprehensible human abuse from burning rain forests to strip mining, acid rain and oil spills. All of us who participate in one way or another in the dominant growth-obsessed market economy bear individual responsibility. Collectively, we act unethically, first and foremost towards the poorest among us who have contributed least to the unprecedented levels of greenhouse gases in the atmosphere. More importantly, we unjustly compromise future generations’ ability to enjoy the blessings and abundance of creation just as we have. Life is a precious gift. We are commanded to tend and shepherd the miracle of life in all its myriad variations. No matter one’s spiritual beliefs or even lack thereof, we all share a deep sense of wonder and awe at the emergence of life here on Earth, our small stunning, spinning speck of blue in the vastness of the cosmos that Pope Francis recently called “our common home”. Let our wonder lead to us to our senses. Humanity can triumph. We must all be mindful of our place in the web of life. We can consume less to meet real needs, not all those extras created by advertising. We can demand sustainably designed products. We can help our neighbors, near and far, to be less wasteful. Our future is in our hands.